The XAU/USD pair advanced to its highest level in six days at $1310.95 per ounce during yesterday's session but failed to stretch higher. Major equity indexes in the US came under pressure after the US trade representative said some of the officials saw China "walking back trade offers" which ramped up the demand for safe havens. However, the situation reversed when Dow Jones claimed that the trade talks were in their final stages and China Vice Premiere Liu was expected to visit Washington soon. On the other hand, the greenback is struggling to find demand ahead of today's FOMC meeting which is expected to be positive and that is a main reason why the yellow metal is still supported above the $1300 level. Gold prices edged higher during yesterday's session to retest previous highs but failed to commit with the upward move and directly retreated towards tee $1303 support level. 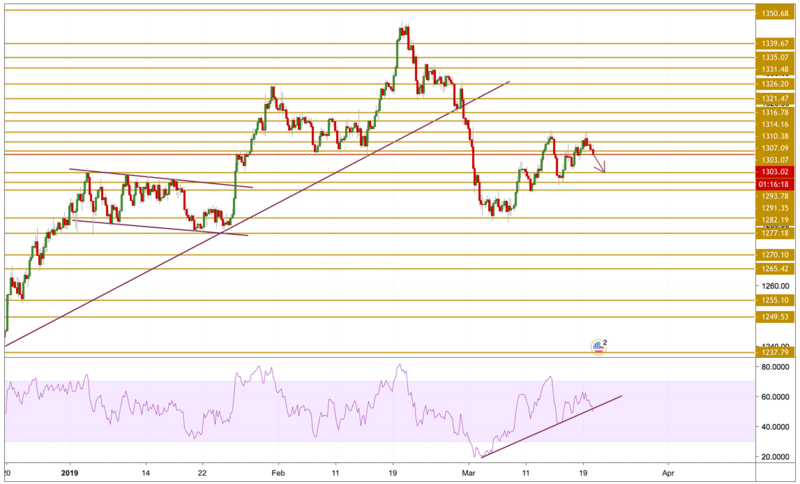 The price is currently struggling to keep its head above the support level and looks set to extend the losses below the $1300 level with a declining momentum. The next level we will be focusing on is the $1297.09 level.